Sports are about having fun, promoting physical health and bringing people together. Special Olympics Unified Sports Teams do all of that – and shatter stereotypes about intellectual disabilities in the process. Unified Sports Partners (athletes without intellectual disabilities) play an invaluable role in the lives of our athletes – becoming teammates and friends with our athletes on and off the playing field. 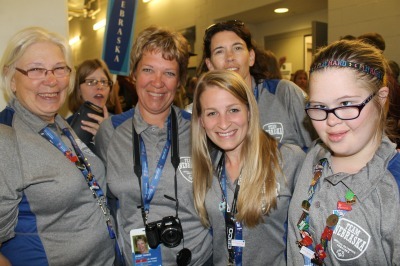 Whether you are a sports junkie, recreational enthusiast, or competitive athlete, there is no better way to combine a love of sports with the rewards of volunteer service than by becoming a Unified Sports Partner for Special Olympics Nebraska! Unified Sports joins people with and without intellectual disabilities on the same team. Teams are formed with people of similar age and ability to make practices more fun and games more challenging and exciting for all.